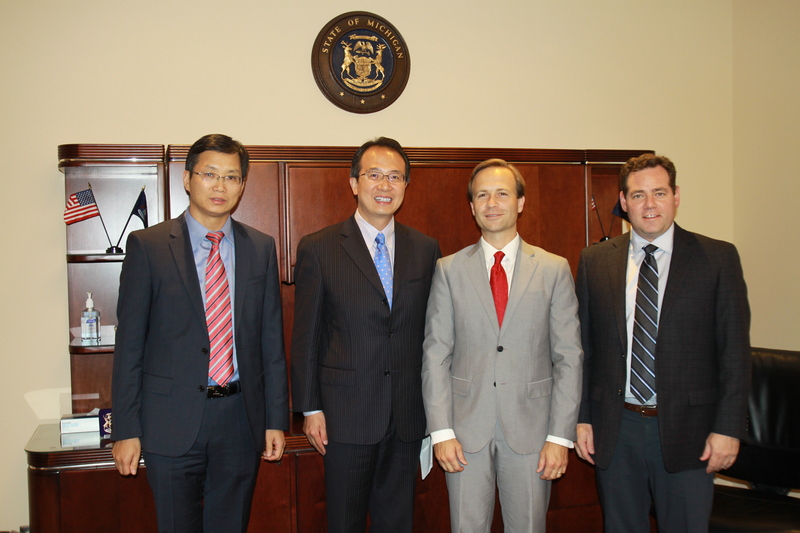 On August 29, Consul General Hong Lei visited the State of Michigan and met with Lt. Governor Brian Calley in Lansing, the State Capital. Consul General Hong Lei said that in recent years, friendly exchanges and cooperation between Michigan and China have featured with many highlights and yielded remarkable results. Michigan’s sister state/province relations with Sichuan Province and Guangdong Province in China have been further developed. A large number of Michigan enterprises such as GM and Ford have taken root in the Chinese market and achieved good business performance. More and more Chinese companies come to invest in Michigan and contribute to Michigan’s economic revitalization. In 2015, Michigan’s trade volume with China reached 12.4 billion US dollars and China became the third largest export market for the State. These achievements have demonstrated the positive effects of mutually beneficial and win-win cooperation between China and the US. Currently, there are more than 11,600 Chinese students studying in Michigan colleges and universities. Quite a few Chinese arts groups and many Chinese artists have come and performed in Michigan, which has become a new highlight of people-to-people exchanges between us. The Consulate General would like to make joint efforts with Michigan State Government so as to further promote China-Michigan relations. Lt. Governor Calley said that Michigan cherishes cooperation with China and considers China as a priority for Michigan to expand foreign trade and economic relations. The State Government actively supports the two sides to further expand cooperation in economy and trade, education, culture and other areas. Currently, Michigan economic development enjoys a good momentum and business environment continues to improve. Michigan welcomes more Chinese enterprises to invest in Michigan. The State Government will support and facilitate their growth.